Brought to you by Media Entertainment NV, ReloadBet certainly looks the part with an attractive, easy to use website and loads of content apparent the second you click. If the rest of the experience can match the first impression, then they might be onto something special. ReloadBet isn’t exactly the most subtle of betting sites. The first image you see is a three-step explanation of how to get on the site. It then hits you with a good reason why, with an advertisement for its 120 Euro First Deposit Bonus. It’s both brash and confident, but does so with a good enough sense of style and ease to pull it off. With the website certainly looking the part and the bookmaker operating in 30 countries around the world, there’s little doubt that ReloadBet goes all out to impress newcomers. But whether the site can live up to expectations, or whether this is all style and no substance, remains to be seen. Check out the rest of this review to find out exactly whether ReloadBet is a surefire hit or a misfire. Considering how prominently displayed the ReloadBet promotions are, you would expect them to back up that confidence with some very favourable terms and conditions. There are actually seven promotions overall, so we’re going to take a look at just three to give you an indication of what to expect throughout, although they won’t all necessarily all be of the same quality. Also, it’s important to know that these are not all the terms and conditions on the site but merely the ones we thought most suitable for an overview. Please check the ReloadBet site for yourself for full details. 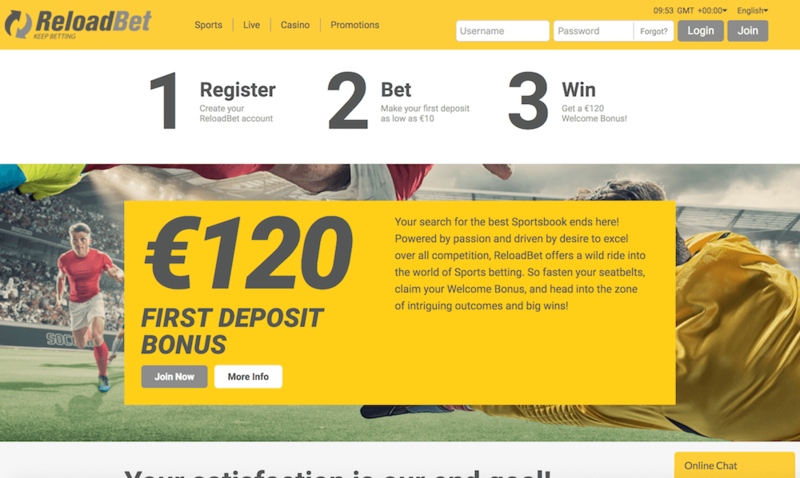 120 Euro First Deposit Bonus: Of course, we had to begin with one of the first things we see when we enter ReloadBet and that’s the First Deposit Bonus. This is a 100% bonus, so we’d say that the percentage and max amount are about what you’d expect: competitive but not mind-blowing. However, what really sets this apart is that the wagering requirement is only 1x, meaning the full deposit has to be wagered just once, with minimum odds of 1.50 in 14 days. 50 Euro Sports Free Bet Bonus: As a reward for betting 10 separate live sports bets on either football or ARP/WTA games with minimum odds of 2.00, you will receive a bonus of 50 euros. However, the minimum for each qualifying bet is 10 euros, meaning that this bonus comes to 5% of the total value of the qualifying bets. Weekend Casino Cashback: Receive cashback on money wagered in the live casino each week. As an example, 100 euros wagered will receive a 10 euro bonus, while 10,000 euros wagered will net you 100 euros. Essentially, this is a 10% bonus on money staked in the ReloadBet casino. As you can see, the quality does vary across the ReloadBet promotions but nothing to the point we would say is uncompetitive. Overall, it’s a good selection of bonuses, if not quite the home run it could be with a little more creativity. One area in which ReloadBet does excel is in variety. Although football is quite clearly the main course here – as evidenced by the dedicated football specials section alongside specific categories for various leagues like Seri A and the Premier League –, there’s still plenty of side dishes in the form of over a dozen other sports options. These include things like e-sports and entertainment. It’s not the largest selection in the world of online betting. After all, there’s some pretty ferocious competition out there. However, it’s still pretty impressive regardless. On top of that, there’s also live betting options and a dedicated casino, complete with table games, slots, video poker and more. And that’s not to mention a decent live casino selection. ReloadBet does not currently have a mobile app available, but they do have a pretty seamless scaled-down version of the site for use on mobile and tablet devices. Players on the go will be able to access all the content, from sports betting to live games and the casino while on the go. 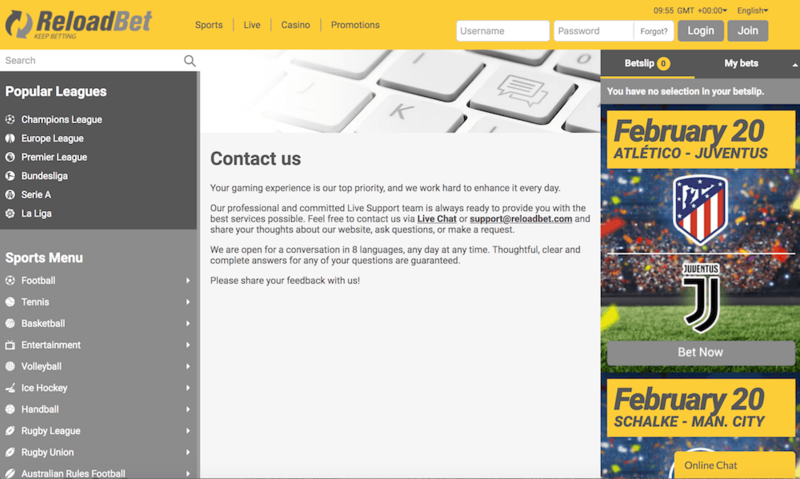 On top of this, ReloadBet also offers customer support via live chat on the mobile site. All in all, we have no complaints here, with the mobile version running just as smoothly and being just as easy to navigate as its desktop counterpart. Unfortunately, this is a section in which ReloadBet doesn’t show off its best, with a lack of both live streaming and virtual sport sections. There’s not a great deal to add here – they are simply not present, or, if they are, they are extremely well hidden. The only example of live features we can see would be the live casino that we’ve already mentioned. Another area in which ReloadBet is sadly falling short is in the information provided to users about deposits and withdrawals. Although there is plenty of general information regarding payments, it is, unfortunately, lacking on details when it comes to things like minimum and maximum amounts and transaction times. We can see from the bottom of the page that ReloadBet accepts plenty of safe, major payment types, and there’s nothing in our research to suggest that there are any issues in this regard. That being said though, it is frustrating to not have all the details that we need to know accessible to us. In fact, the link for payments appears to be broken at the time of writing, simply bringing us back to the home page. This gives us hope that this is a temporary issue that will soon be resolved. Once again, this is another area where we were left disappointed with ReloadBet. Our experience with customer support wasn’t excellent. As you can probably tell from this review, in certain areas, we weren’t always able to get the answers to questions we asked. However, as they don’t seem to have a bad reputation in this regard, we are hoping that this is down to us having a particularly bad user experience as opposed to what you can expect in general. While we can’t give them top marks based on our usage, we can when it comes to options, with live chat and email being available across seven languages. ReloadBet is licensed in Curacao as part of Media Entertainment NV, with a sublicense by Curacao Interactive Licensing NV, according to their About Us section. They also reassure users that their data is secure thanks to SSL encryption technology, and the promise that no information is passed onto third parties. That, alongside generally good responses regarding the site’s reputation according to our research – not to mention a wide variety of odds – means that ReloadBet appears reliable from what we can gather. 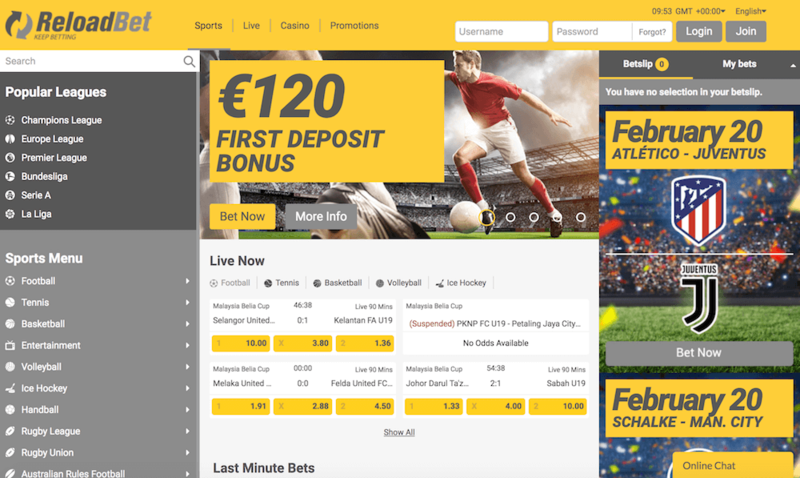 When we took a look at promotions earlier, the sports First Deposit Bonus was clearly the most attractive offer, so we have high hopes for the 300 Euro Casino Welcome Reward. This is a 100% bonus on the players first deposit, with a minimum of 20 euros. This needs to be wagered 25x in order to unlock the winnings. While this is nowhere near the bargain of the other welcome bonus, it still remains very competitive – perhaps ReloadBet just spoiled us before. We can’t say that our journey with ReloadBet was as smooth sailing as our first impressions led us to hope. It’s clear that there are still some areas with issues that need ironing out, from the lack of details in some areas to places where additional content would be appreciated, particularly with regards to virtual sports. Nonetheless, we’d say that overall, ReloadBet is a success. It’s fun, easy to use and, for the most part, has plenty to offer, although there does remain a certain amount of wiggle room for improvement.